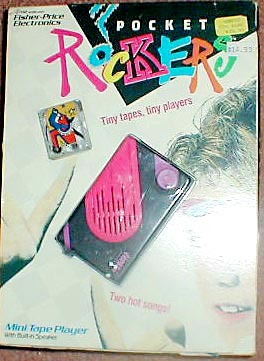 Description: This is an assortment of miniature tape players, called "Pocket Rockers". Each tape player is easy to operate, simply put the accessory tape into the player and it will automatically play. Take the tape out, and the player automatically turns off. A slide switch allows children to select between two music tracks on the tape, and children can control the volume control as well. The players have built-in speakers, plus a standard headphone jack, and a detachable carrystrap. Each player comes with a mini-cassett tape containing two popular three-minuite song tracks and a plastic molded belt clip. The tapes are uniquely decorated for collecting and trading. Each tape comes with a matching design trading card. Requires two AA-size batteries (not included). Designed for children ages 5 years and older. Each set in this assortment was sold in a 8" long, 11" high, 2-1/4" deep display box.